Austin, TX. Despite the tough economy and declining building industry, Portella Iron Doors introduces a new look, a new web site and a new showroom in the Austin area. Portella Iron Doors announced the grand opening of their new Austin showroom in October of 2010. Portella Iron Doors, formerly Portella Custom Doors, is a nationally recognized manufacturer of high quality iron doors, steel doors, gates, railings and hardware with locations in throughout the US. Their wide selection of outstanding hand forged iron products, steel doors and windows, as well as custom designed iron products are available online as well as at local showrooms. The family-owned business’ commitment to superior products and outstanding customer service has enabled them to grow despite the challenging economic conditions. With the introduction of a new line of contemporary doors; Portella owners, Michael and Marti Medina have updated the logo and brand identity to reflect current trends in the building industry. 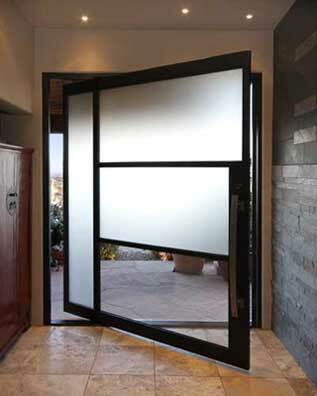 Portella also developed a full line of architectural entry systems, including steel windows and doors. The Architect Series – popular in commercial properties as well as high-end residential buildings – are European-influenced in design with thin profile narrow sight lines making them a versatile choice for homeowners, builders and architects. Portella continues to forge trends in architectural design with the MoMa Series introduced in 2010 – an ultra contemporary line of iron doors. “Our clients absolutely love the MoMa Series. It’s been really exciting to combine centuries-old forging techniques with minimalist modern designs,” says Medina, “I think the fantastic reception we’ve had to the new line is exciting feedback and reinforces the demand for custom iron doors and products in both commercial and residential building.” The new designs and company growth were the catalyst to update the company logo along with Portella’s website, http://www.portellairondoors.com which was completely redesigned with a fresh, clean look and intuitive navigation. Portella Iron Doors is a national manufacturer of high-end iron doors and metal products. Headquartered in Austin, Texas. Portella Iron Doors offers a wide selection of iron doors, iron gates, iron railing and hardware online and in showrooms in Arizona, California, New Jersey, and Texas. To learn more about Portella Iron Doors, visit their website at www.portellairondoors.com or call 1-877-263-8851.